Activators are a powerful tool for controlling how, when, and how often an input responds to you. Have you ever played, say, a menu-driven RPG and gotten frustrated that you had to repeatedly push "down" to scroll through a list of hundreds of items, one at a time? Activators let you define simple macros like, "If I hold DOWN for 1 second, repeat DOWN every 0.1 seconds thereafter until release." Ta-da! Now you can scroll through that list in a jiffy just by holding down the button, even though the developers never implemented it! Selecting that, we see this menu, and select "Show Activators." So first thing's first -- let's select "Long Press" as our activation type. This is what will trigger the special behavior. 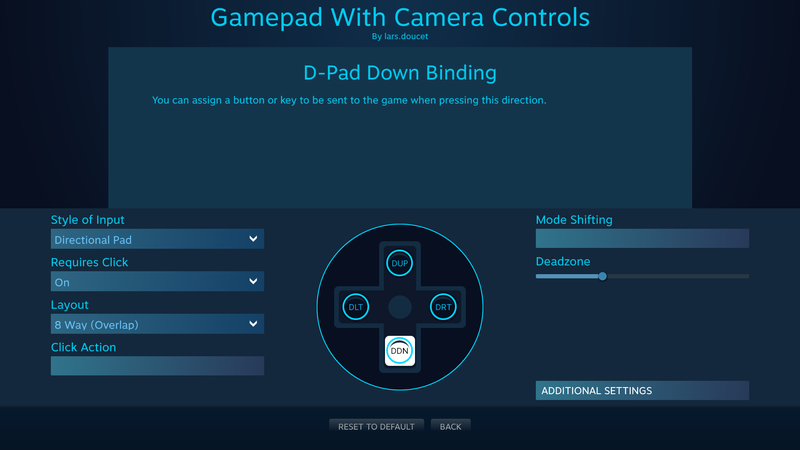 By default, the activator's binding is set to the original input (Dpad Down), which we'll leave because that's what we want. We'll also leave "Long Press Time" on the default value, 0.15 seconds. We'll leave the "Repeat Rate" at it's default value, 0.9 seconds. 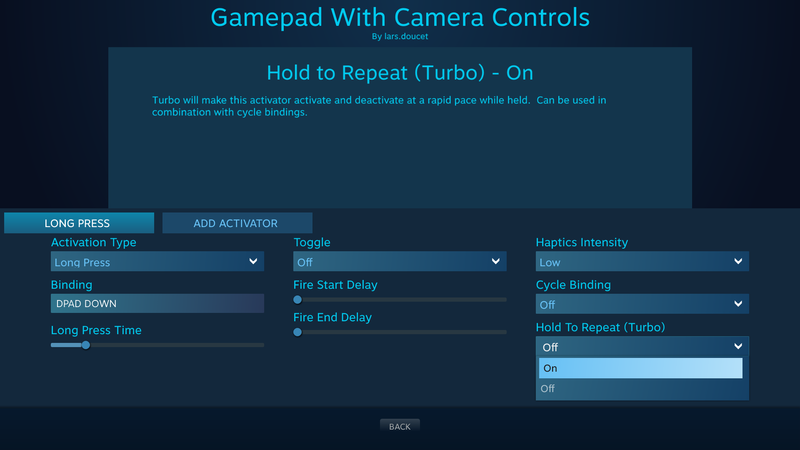 Now, whenever Dpad Down is pressed and held for longer then 0.15 seconds, every 0.9 seconds therafter it will pulse an additional Dpad Down event until the input is released. These timings can of course be adjusted to taste. If you want to add several different activators, you can do that by selecting "Add Activator." You can remove an activator by selecting "None - Remove Activator" as the Activation Type. There doesn't seem to be a limit to how many activators you can add, but any more than five will start to run off of the interface. Activation Type Regular Press, Double Press, Long Press, Start Press, Release Press, None - Remove Activator Activators determine how the input responds to you. Is it a regular press, a long press, a double tap? Select them here or remove them. 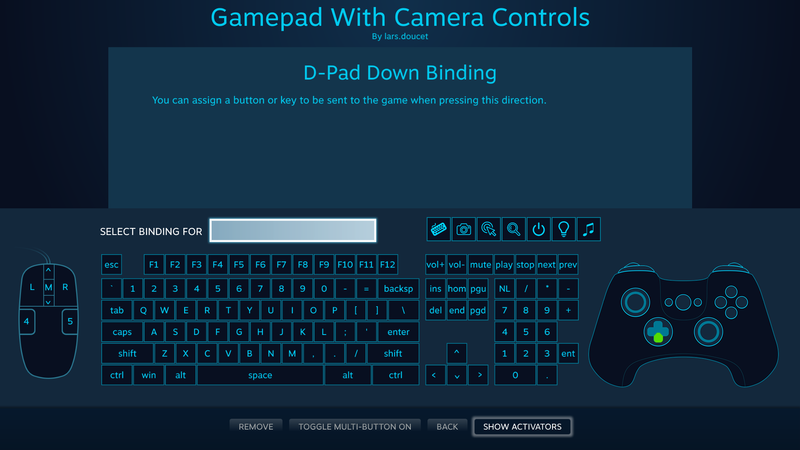 Binding Digital input/action You can bind one or more actions to this activator, such as keyboard, mouse, and gamepad buttons or native actions. Toggle On, Off Toggle will make this activator continue to be active after releasing it until it is pressed again. 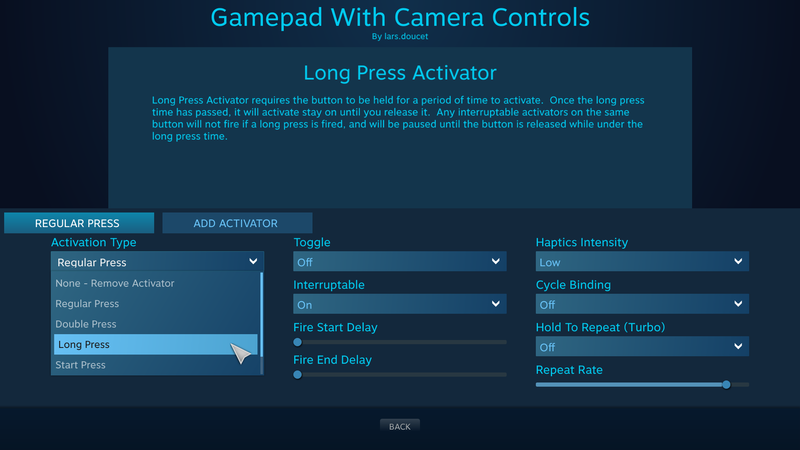 Fire Start Delay 0.0-1.0 The activator will wait for this period of time after the button has been pressed before activating. This delay will offset the entire period the button is held, so if no end delay is set, the total period of time the button is held will be the same, just delayed. Fire End Delay 0.0-1.0 The activator will wait for this period of time after the button has been released before deactivating. The end delay will make a button be active for longer than it was physically held. Haptics Intensity Off, Low, Medium, High This defines the strength of haptics on activation and deactivation of the activator. Cycle Binding On, Off Cycle Bindings will make this activator cycle through each of its bindings in order each time it is activated. Order is determined by the order they were selected in the button binding process. Interruptable Off, On Regular Press, Release Press Interruptable activators can be paused or stopped by other activators. For example, a Long Press activator can interrupt a Full Press activator so the Full Press only fires if the Long Press doesn't. If not interruptable, it ignores the other activator in regards to behavior. Double Tap Time 0.0-1.0 Double Press Determines how fast you must double tap to activate the activator. Any interruptable activators also on this input will not fire until this time has passed. Long Press Time 0.0-1.0 Long Press Determines how long you must hold the button to activate the activator. 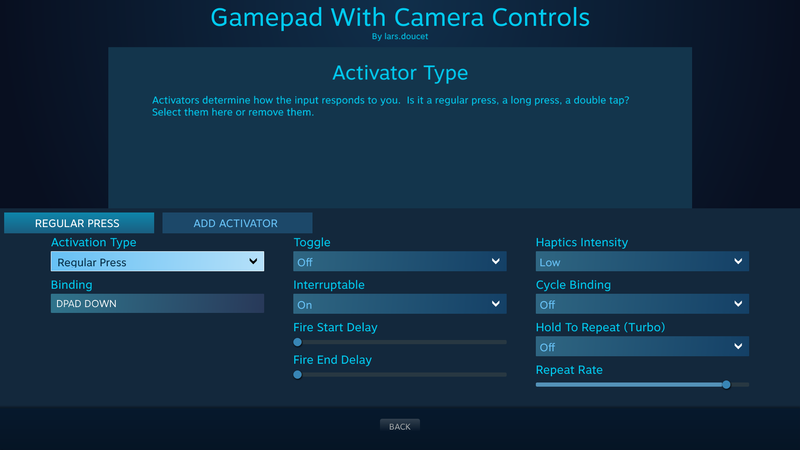 Any interruptable activators also on this input will not be activated until the button is released prior to this time and they will not be activated at all if the Long Press is activated. Hold to Repeat (Turbo) On, Off Regular Press, Double Press, Long Press Turbo will make this activator activate and deactivate at a rapid pace while held. Can be used in combination with cycle bindings. Repeat Rate 0.0-1.0 Regular Press, Double Press, Long Press The speed of Turbo will be set by this slider.